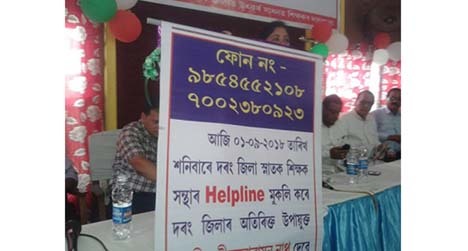 Ahead of the celebrations of Teachers’ Day, the Darrang district committee of the All Assam Higher Secondary Graduate Teachers’ Association on Saturday launched two helpline numbers for the students from the economically weaker section of the district. This decision has encouraged the students of the economically weaker sections who can’t afford private tuition. Additional Deputy Commissioner, Darrang, Kalpana Deka ceremonially launched the two mobile helpline numbers – 9854552108 and 7002380923 – in a public function organized by the teachers’ body at Mangaldai Youth Club auditorium. The teachers, who have significant role in the achievements of excellent results in the last HSLC and High Madrassa final examinations, were also felicitated at the function. A strong team of 24 experienced teachers in nine different subjects are involved in this helpline service to offer free reply to any query of a student in every remote corner of the district. Speaking on the occasion Additional Deputy Commissioner (ADC), Kalpana Deka appreciated the teachers’ body for such a unique and student-friendly new technology-based idea and appealed to the teachers to sincerely carry forward this initiative. This was followed by a felicitation session for young teacher Sasanka Hazarika of Dahi Higher Secondary School , selected for this year’s National Teacher Award and 12 other teachers, who contributed a lot in the excellent performance of the district in HSLC and AHM final examinations. Each of the teachers have been felicitated with a traditional Assamesegamosa, japi and citation. During the function, veteran academician and writer Dr Nagendra Nath Sharma and Associate Professor of Government Teachers’ Training College, Mangaldai, Hemanta Kr Tamuly, delivered speeches on the topic teachers’ accountability on the qualitative development of the students. The speakers also threw light on the importance knowledge-based qualitative teaching instead of marks-oriented quantitative teaching. They stressed on the need of value-based education developing qualities among the students so that they can establish themselves in any professional field rather than running for Government jobs. Several other speakers including Mangaldai MLA Mangaldai Gurujyoti Das, Darrang Deputy Commissioner Ashok Kr Barman, Additional DC Narnarayan Nath, Inspector of Schools Nagen Ch Boro, industrialist Anupam Deka also spoke on the occasion. Earlier, the day-long function began with paying of floral tribute to Dr Sarvapalli Radha Krishnan led by Kamruz Zaman, president of All Assam Higher Secondary Graduate Teachers’ Association followed by ‘smriti tarpan’ initiated by Basab Deka, secretary of the State teachers’ body.